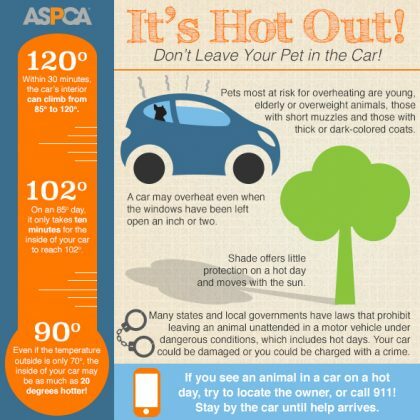 Never leave your animals alone in a parked vehicle.Not only can it lead to fatal heat stroke, it is illegal in several states! Open unscreened windows pose a real danger to pets, who often fall out of them.Keep all unscreened windows or doors in your home closed, and make sure adjustable screens are tightly secured. Remember that food and drink commonly found at barbeques can be poisonous to pets. 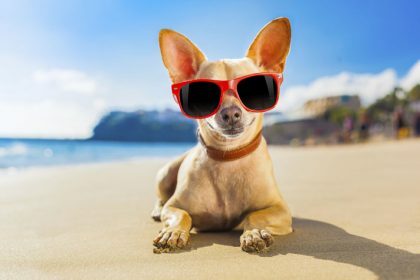 Keep alcoholic beverages away from pets, as they can cause intoxication, depression and comas. Similarly, remember that the snacks enjoyed by your human friends should not be a treat for your pet; any change of diet, even for one meal, may give your dog or cat severe digestive ailments. Avoid raisins, grapes, onions, chocolate and products with the sweetener xylitol.